I went to Zonnebeke, Belgium in early December 2014 to see the area in which my grandfather Lt. Pat Somerville was captured on Oct 21st 1914. Read his account here. This first battle of Ypres fought only two months after the outbreak of war was where in a sense the war was won, neither Ypres the last defensible position before the coast, nor the pas de Calais area fell throughout the war, the British nightmare of the enemy on the coast opposite Dover was averted. The British Army, both regulars like my grandfather and the Territorials, the weekend soldiers, along with the French and Belgian conscripted armies stopped the German onslaught towards the Channel ports. It was as Wellington said at Waterloo, ’a very close run thing.’ The ‘Old Contemptibles’ had saved the day, but had been decimated. 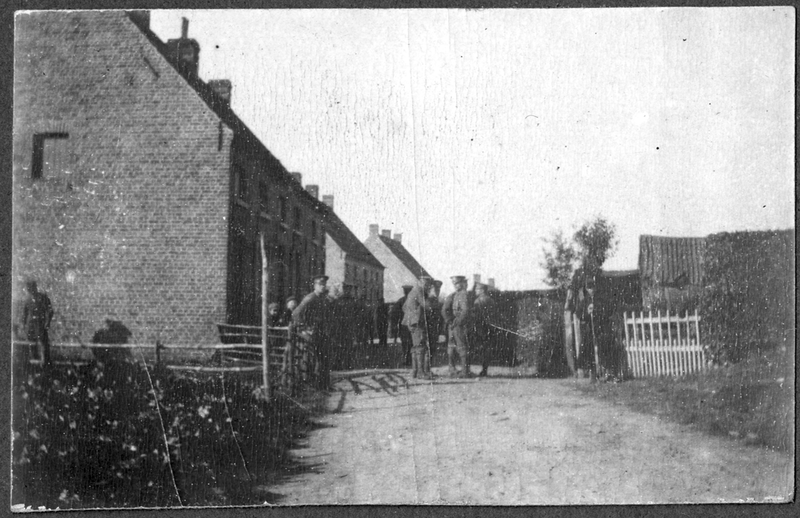 As Somerville says in his account of his interrogation after capture, the Germans believed that the area between the line at Zonnebeke and Ypres was full of British reserves; this was not the case and if the Germans had pressed their attacks further the battle would have been lost. General Haig believed he had learned a lesson from the Germans, that it was best to press on even when stalemate appeared to have been reached, with heartbreaking results particularly at the Third Battle of Ypres, known as Passchendaele, in 1917. 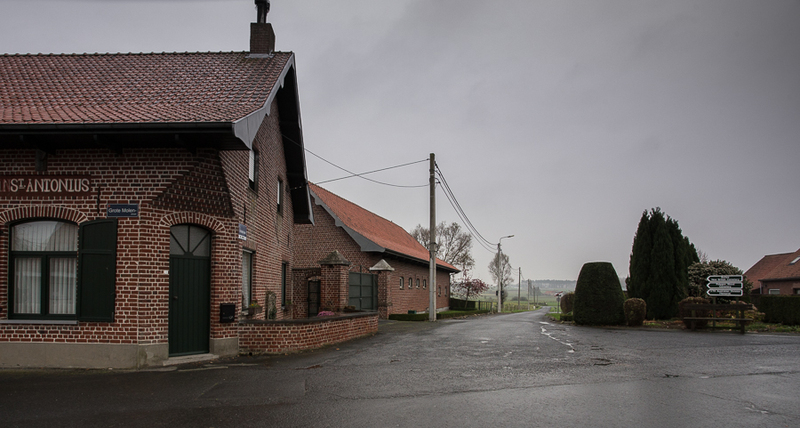 Zonnebeke is and was a small place. The rebuilt chateau on the edge of the village by a lake is now the Passchendaele Museum. Zonnebeke church 1914, March 1918, 2014. The extensive British dugout beneath the ruins is still there. 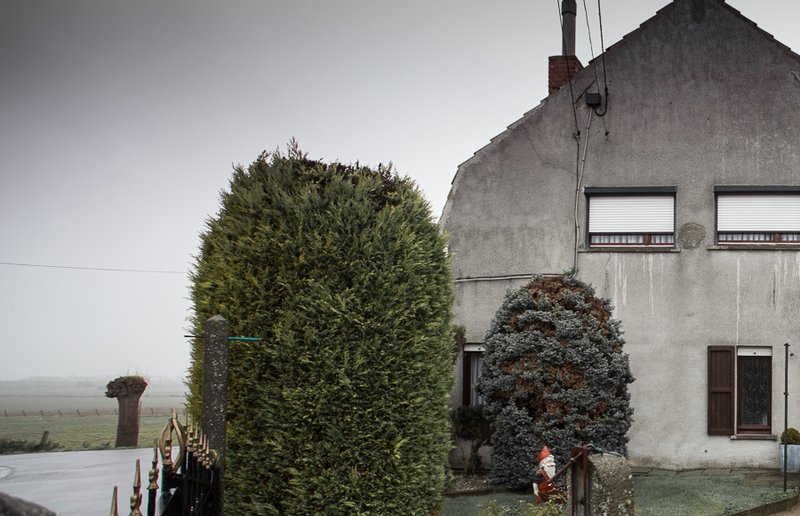 The Belgians rebuilt their shattered towns after the war pretty much as they were. In fact Ypres itself is surprisingly like every other Belgian town that was left untouched, despite the fact that the entire area was practically razed. The rebuilt Zonnebeke church is an exception, it is an ugly, vaguely modernist building; in the 1990s it was found to have a 1917 vintage dug out beneath it, the entrance to which is in the churchyard; it is flooded and closed. I visited the Passchendaele Museum next door. The museum has no shortage of genuine artefacts. 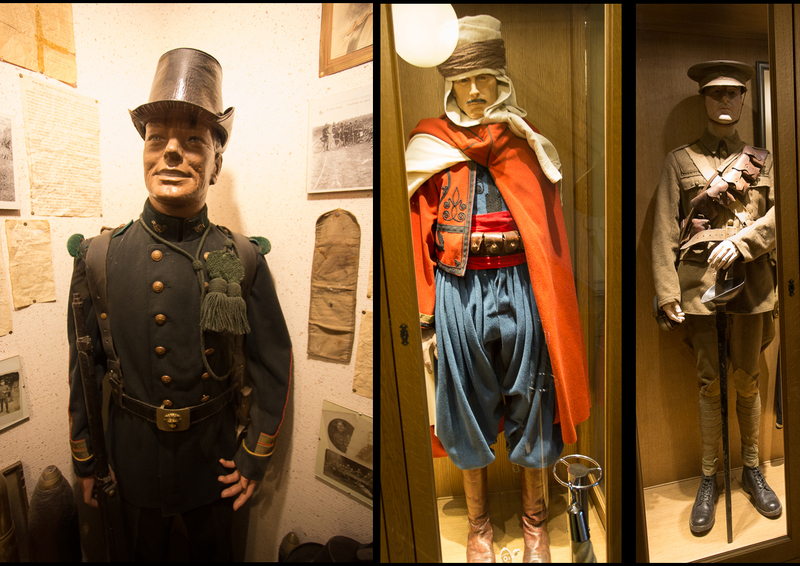 I was struck by the old fashioned look of the uniforms in which the French and Belgians went to war, left over from a previous age. 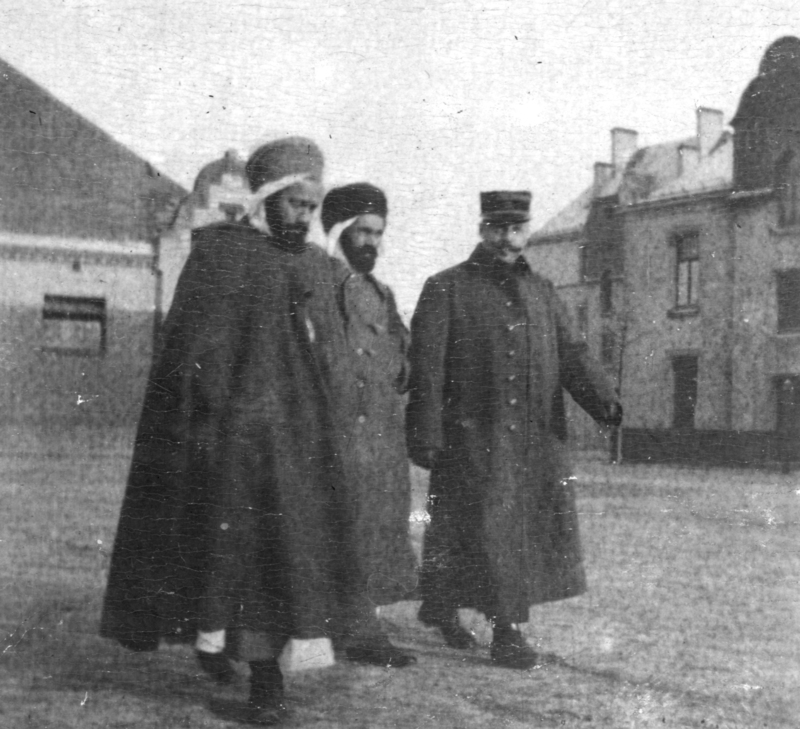 My grandfather photographed two French colonial officers inside Crefeld POW camp in 1915, the gorgeous red cloak must have cut a dash in the camp yard. Afterwards I spent a night in Ypres. The town was completely rebuilt in the twenties in the prewar style and is a charming place, despite the tragic associations. The reconstruction of the magnificent mediaeval Cloth Hall was not completed until 1967. The following chilly and foggy morning I drove around the area to the north of the town. I stopped at the notorious Hell Fire Corner, for four years the most dangerous place on the Western Front. I reflected on the fact that if this innocuous roundabout was once hell on earth, then if not nowadays exactly paradise, it is at least like everywhere else in Belgium and one hopes that the Kobanis and Homs of this world will be just as peaceful in the near future. I moved down the Menin Road to the Hooge Crater where there is yet another museum opposite the cemetery. In fact The First World War is something of a local industry. Whilst I was there a large party of Belgian teenagers from Bruges was visiting. There was even a British 25 pounder gun outside, a reminder that war passed this way again in 1940 and 1944. The museum offered bits of brass shells, 303 bullets and other ephemera for sale. Outside in the yard shells and other detritus were piled up, the iron harvest will no doubt continue for millennia. 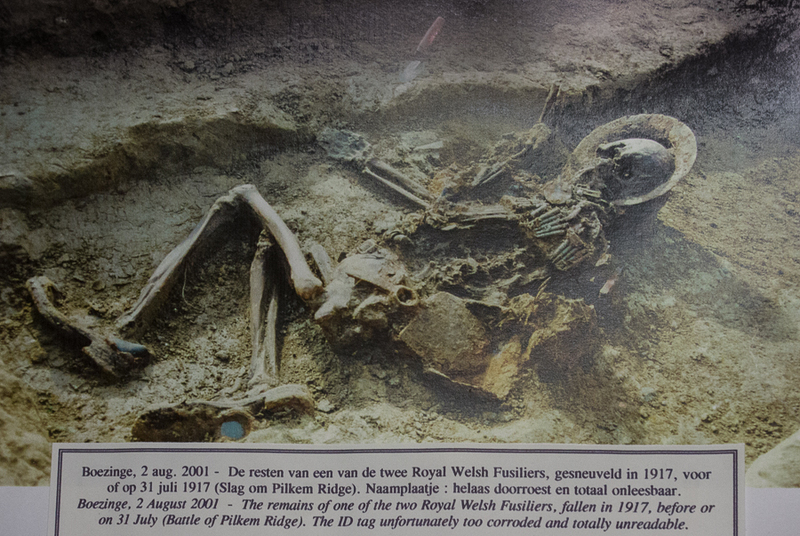 The harvest is not just iron, a third of the dead have no known grave, the area round Ypres is a huge cemetery and owing to the nature of the ground bodies will be recovered from the clay for generations to come. 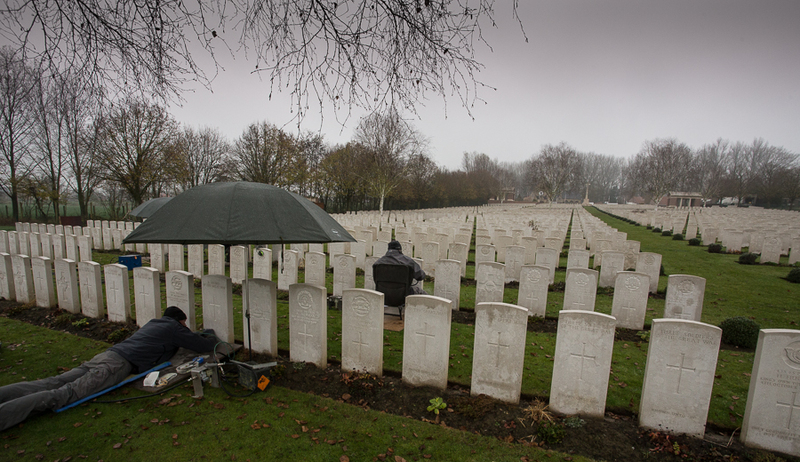 In the nearby cemetery men from The Commonwealth War Graves were working under umbrellas with what looked like dentists’ equipment to clean up the names etched on the tombstones. The 2nd Warwicks were deployed on the right of Zonnebeke at a crossroads north of Polygon Wood which I did my best to identify. However, given that this area was fought over continually for four years and a further two major battles took place in and around Zonnebeke, I could only guess at the site. 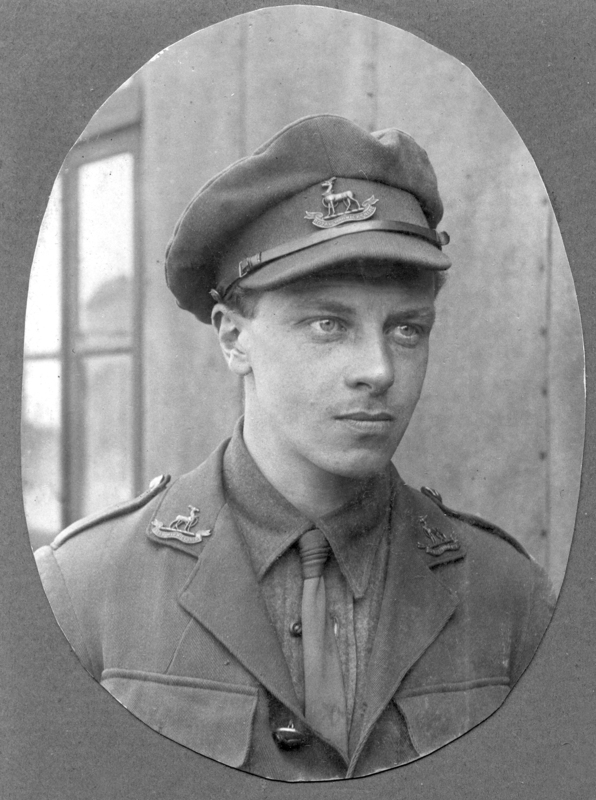 Lt Pat Somerville, a wounded Lt Collins and their men were all captured after the German force came up behind them from a sunken road the night of 21 October 1914. Crossroads S.E. of Zonnebeke. Polygon wood on skyline. Could this be the place? An overwhelming feeling of sadness at the suffering that seems to be soaked into the landscape made me move on to Bruges in the mid afternoon. 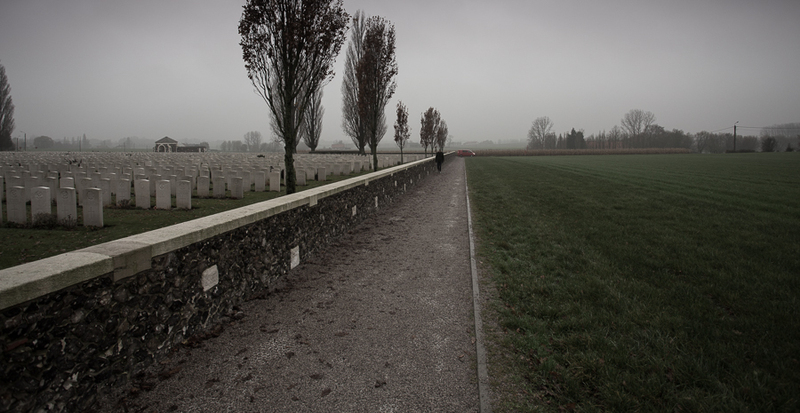 It was all I could do stop for a visit at the Tyne Cot Cemetery, such was my feeling of gloom. In all there are approximately 850,000 dead in this area from both sides. I wondered how the locals could bear to live in such a dismal place, but then I saw the gnome in a garden beside the cemetery and felt that the human spirit was truly indomitable. Next stop Krefeld to find the PoW camp.